We are all so busy. Sometimes it is hard to find the time to take care of our home. We rather forget about the maintenance jobs we need to perform, and enjoy the free time. If you face this problem, we have got you covered. 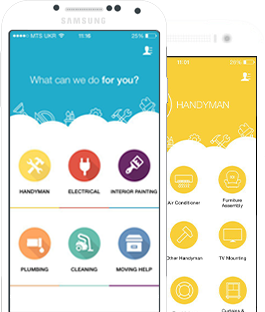 FixyFix provides a platform that connects you to experienced professionals specializing in cleaning, handyman, electrician, and plumbing jobs. Get in touch with us for all of your homecare needs. Some of our popular services are home cleaning, light fixtures, fixing and upgrading leaky faucets, assembling furniture, moving help, and interior painting. So, let us know what you need and we will send a professional to your door within 24 hours! ○ Cleaning services includes home and office cleaning. Experts handle all of these services, so you don’t have to worry about a thing. ○ Our handymen can fix shelves, pictures, air conditioners, assemble furniture, mount TVs, install curtains, blinds, knobs, locks, and other housework that don’t require too many tools. ○ Our plumbing services include fixing and upgrading toilets, garbage disposals, faucets, drains, and other plumbing systems. ○ Our electrical services include installing light fixtures, ceiling, fans, electrical outlets, and other electrical services.